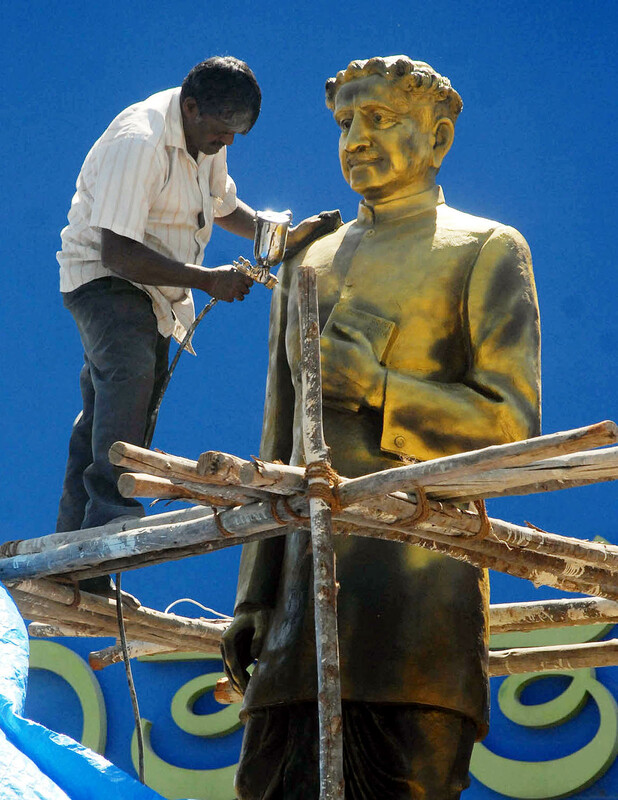 An artist gives final touches to the statue of Kuvempu near freedom park, in Bangalore on Sunday. This entry was posted in Kannada & Karnataka, Literati and tagged Churumuri, Freedom Park, Karnataka Photo News, KPN, Kuvempu, Sans Serif. Bookmark the permalink. It is nice to hear that nine-and-half ft ‘VISHWAMANAVA KUPPALLI VENKATAPPA PUTTAPPA’ statue is being installed at Freedom Park.Kannadigas cheeeeeeeeeers..! Kuvempu – An over hyped poet in old mysore region. I would rate Dattatreya Ramachandra Bendre , Masti Venkatesha Iyengar above kuvempu. Not because DaRabendre and Masti was brahmins, they had real talents and were not overhyped poets. One more neglected legend was DVG. @kashi..LOL…KANNADA IS DYING IN BANGALORE !! !…DA RA BENDRE,MASTI VENKAYESHA IYENGAR,KUVEMPU,DVG,ETC,ETC. STATUTES ATLEAST RETAINS HONOUR FOR KANNADA/KANNADIGA/NAMMA BENGALURU/KARNATAKA MAN !!! !BECAUSE NO INDIAN LANGUAGE STAND INFRONT OF KANNADA….”””BECAUSE KANNADA LITERATURE IS RICH AND VERY VAST””’…….!!!.. @@@KASHI ….BE A ”’VISHWA KANNADIGA””’ SIRIGANNADAM GELGE.. Happy that agriculturists are getting some money. Increase the amount of awards atleast to lakhs in these days of Kannada Kotyadipathi and price rise they cannot survive on thousands. Take up the cause of rivers and protecting water table and dont play games by diverting rivers to other states. Please regulate APMC online and give farmers ipads and build applications to access them.